The prisons need not be “full of non-violent drug offenders” for it to be a really dumb policy to threaten imprisonment. This is especially so in a system where jury trials are so rare and where so much evidence is based on that of offenders looking to escape prison themselves. That’s a system ripe for abuse and rotten because so much of what passes for process is only window-dressing. That is even assuming the threat of imprisonment, let alone the fact of it, does anything at all to stem the availability of drugs, presuming that is the goal instead of simply satisfying the atavistic urges of our legislators. We all know the answer to that. American government is in policy-lust with prison because it is so stunted for new ideas and because it prefers the delusion of enforcing “personal responsibility” in the face of government inaction to stem the numerous factors in American society that make crime an attractive alternative to, say, those millions of low-paying service sector jobs that the president just this week noted might still be a problem. Yes, prison populations have shown some signs of falling a bit from their peak, but only because the public’s patience for new construction has been eclipsed by the fact such policies have revealed themselves as the wrong tool for the wrong job in a time of general austerity. Before that, they were the only government jobs program that we had left, sad to say. I have argued for a quarter century that no one should go to prison simply for consuming a drug (not just marijuana, any drug), and have worked with states to move drug-addicted people out of prison, indeed am doing so now with 3 very different states. But I still want the truth to be told about public policy and information to be accurate. I talk to legislatures and governor’s offices who ask me how big the drug offender population is because they have heard on the news or read on the Internet that it’s almost everyone in their prison system. I tell them the truth, that it isn’t. I understand that aspect of the issue with reporting on prison populations. But that’s sort of like your mechanic telling you that your radiator cap is spitting when the real problem turns out to be a blown head gasket. Prison is and always has been a trailing indicator. Some would take the brief and shallow dip in prison populations as sign of a turn in the drug war, but that’s hardly the case. I’d actually be more curious about law enforcement costs and grants and other aid available to persecute the drug war in relation to these trends. I’d almost bet there’s a bigger correlation between budget cuts for filling the prisons than there is any actual reduction in drug use. In other words, it’s simply a politically acceptable jobs program in an era where the very idea of government propping up jobs seems poisonous in any other context. If legislators see the issue as how big a budget they need to “solve” the problem of housing these offenders, the answer from a policy POV should be not a discussion of stark numbers, but what those numbers indicate. When the prisons regularly fill up to their budgeted capacity, and this goes on for years, even decades, with little change in the indications of the scope of the problem, then a better piece of advice might be to consider what the end game is. Because incarceration, for all the feel-good vibes the “lock em up!” campaign slogan brings in, has changed nothing. The uncritical approach and lack of evidence-based substantiation for incarceration is a glaring exemption to the scrutiny nearly every other government program is under these days. Now, if those politicians are just looking up an excuse to do nothing and give the public another 365 days of the same old same old, then that answer probably works well. A little lower down in the comments, you note your support for concentrating law enforcement resources on other than personal level offenses, i.e. going after the big guys making money off other’s misery and addiction, which brings to mind whether marijuana offenses are compiled in these totals. If so, I’d argue that is a massive inflation of our real drug problems. Where marijuana does rise to the sort of problematic behavior that harder drugs cause, it is almost wholly a result of the government-enabled black market. Legalize cannabis, and that solves that aspect of the problem IMO, although I’m certain YMMV on that. But making that shift to the big cheeses of drugs is going to be awful hard on the police and their statistics. It’s all those low level arrests that create the numbers justifying present policy. And it’s also the leverage of inflated charges — an endemic problem in the American justice system and its election driven method of picking what should be professionals, not politicians — that drives the whole system. You catch a guy with a baggie of whatever that’s just enough under the circumstances to rate “intent to distribute” add-ons, then leverage the charges down depending on their cooperation. I certainly endorse your initiative, but doubt that law enforcement will be very enthusiastic at your proposal to take away their daily shortcut to the donut shop. It’s exactly that sort of leverage this system depends on or everyone who be forced to acknowledge it’s an unmanageable problem — which it is, just one that’s still small enough to hide. It also has totally corrupted the principle of jury of one’s peers or even trial by jury at all. Good luck with that, though, because I could think of few other monkey wrenches to throw into the system except legalization itself that will tie it up in fits if it was implemented. Many of those locked up behind bars (or plexiglass) prefer prison to jail, due to the conditions in county jails. So getting drug offenders to only serve jail time may not be a favor to them. But I think the real question is how many people get locked up at all for drug offenses? Or how many have their lives harmed by the criminal justice system overall? Restricting the data to prison seems a bit misleading. Good point on the difference. Your question about fully appreciating the harm that comes to people not being restricted to time served is an important one. Even if you get some sort of light probation, you may owe thousands of dollars to the legal system for various fines, fees, and charges. Most people will do anything to stay out of jail, but when you don’t have a job, being behind bars gets to be less of an option. In either case, those who imagine we don’t have debtor’s prisons in the US have no experience with the justice system. Once you’re down, they keep kicking you over and over again. Our atavistic politicians like to keep adding to this burden with each election cycle, but it’s long past of the point of being counterproductive, let alone demonstrating any productivity of rehabilitation. Want to keep more people out of prison? Try not charging them so much much to stay out or at least forgive significant portions of such financial burdens for successful achievement of other probationary goals. I do note that the percentage of drug prisoners tripled during the Len Bias years and hasn’t gone down too much since. I also note that this graph is one of stock, not flow. The percentage of people admitted to prison for drug offenses could be constantly increasing, if folk get incarcerated for increasingly long times for violent crimes and less so for drug offenses. I’m also puzzled by “public order.” If I understand the category, these crimes shouldn’t lead to long sentences. This seems to imply that the flow of public order prisoners (prostitutes?) is pretty high. And that seems odd. @Ebenezer: Stock and flow is a very important issue in understanding prisons, and I am glad you raised it. The average length of sentence for drug, property and public order crimes are all lower than they were 20 years ago, but this is not true for violent sentences. The latter group thus accounts for more of the stock. Public order I suspect, but do not know, includes many people with alcohol problems – chronic drunk and disorderly, maybe druink drivers who didn’t kill anyone. It’s hard to imagine a state would put many streetwalkers into prison (jail, yes) but I don’t know. Claiming the prisons are predominantly full of non-violent drug offenders clearly has no factual basis, but per that very chart above, don’t we see several hundred thousand non-violent drug offenders? A bit less than 20% of the bit more than 1.5 million inmates. Even if a third of those have previous violent convictions, that still sounds like 200K too many incarcerations. 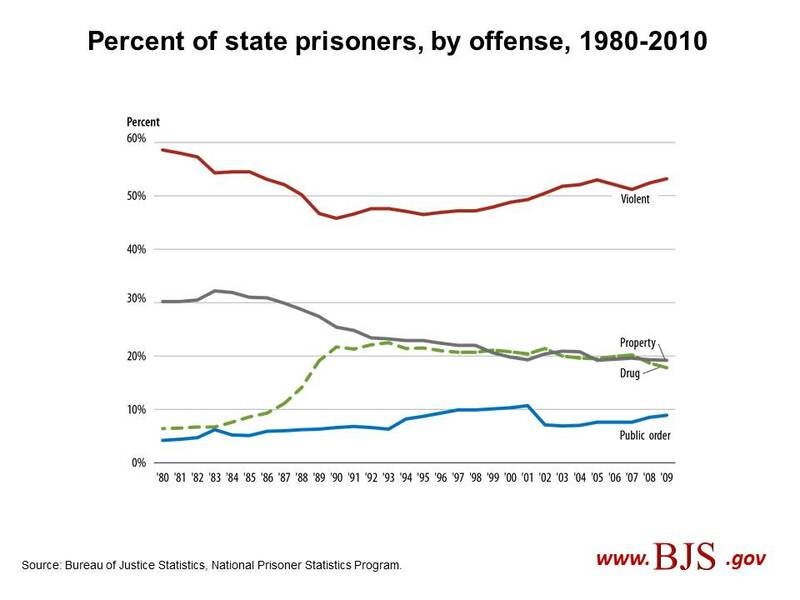 @Blake: At the end of the chart, there were about 240,000 people in state prison whose currently controlling offense was for drugs. Let’s say your one third is correct, that gives us 160k. Some would say none of those should be in prison; my own view both from consuming CJ research and from being in many prisons is that some should and some should not. Jon Caulkins and I have suggested cutting sentence lengths for low-end functionaries in the drug trade (lookouts, street dealers). I also think we can move out all the addicts who committed a series of low-end crimes and plead to the drug charge — we have good evidence that being in a therapeutic community is better for them, for their families and for society. On the front end, we want to avoid putting in prison anyone who can do well in HOPE probation or a drug court. But even if you did all that, there would be some people (50,000 maybe?) in prison on drug charges for long stretches who had never had a violent conviction, e.g., someone who ran a huge cocaine ring but never actually shot/beat/kidnapped anyone in the course of the business. That doesn’t bother me. Sounds like we’re on exactly the same page then. I’ll certainly agree there’s another segment, not directly violent, but problematic for other reasons that merit a cell. The remainder, whether it is 200K or 100K, is lousy for the full trio of reasons: poor or negative rehabilitation results, expensive to maintain, and massively biased towards those most disadvantaged in society to start with. Keith, this is a statistic for state prisoners only. It does not include those in jails (i.e. with a sentence of one year or less) nor those in federal custody. Naturally, this skews the data considerably: about 1/3 of the incarcerated population is held in jails, and the composition of federal prisoners is very different, with more than half of those convicted of drug and immigration offenses. While federal prisons hold only about 220k inmates, combined with the numbers of jail inmates, this cannot be ignored. As a consequence, I do not think that your conclusions necessarily hold up, or at least not to such a degree. That is correct Katja, these are state prison data, hence the title of the post. Yes, but you cannot draw these conclusions from data that ignores over 40% of all inmates with a completely different profile. Point in fact: The robbery rate in England and Wales is actually higher than in the US and rates of assault (defined as a physical attack resulting in injury, but not death) is fairly middle of the road by Western European standards . So, you cannot simply draw the conclusion that “the U.S. is probably too violent of a society to ever shrink its prison population to a Western Europe level”. The big multipliers responsible for the high US incarceration rate are probably still the higher likelihood to receive a custodial sentence, and the harsher prison sentences that are being handed out. Arguably, England and Wales are an outlier in the robbery department and the rates of assault still mean somewhat different things in different jurisdictions, which, combined with differences in how such offenses are reported, further muddle things, but US assault rates are still hardly abnormally high. US violent crime is far more likely to be fatal, but that’s a different story. Yes, but on any given date, there are “only” some 700,000 in custody in local jails, give or take. 40% of an enormous prison population is still.a very large number of people incarcerated for non-violent crime. Yes, the USA is perennially at our near the top in per capita incarceration. How many of these violent crimes are a direct outgrowth of the “war on some drugs”? How many violent crimes were committed in 2012 related to the importation and sale of beer from Mexico? I was going toask the same question, adding the numbers in prison for robbery or theft to get their fix of nicotine or alcohol. … or the 60% or so of violent offenders who were drunk at the time? Let’s split this three ways. 1. Crime in the course of business: illegal drugs (marijuana, cocaine, heroin, meth, &c) – lots; legal drugs (alcohol and tobacco) – negligible. 2. Crime to obtain drug of choice: cocaine and heroin – lots; marijuana – very little (it’s too cheap); legal drugs – negligible for adults (supplying minors is significant). 3. Crime under the influence of drug of choice: alcohol – lots; tobacco – nil; illegal drugs – a little (eg driving under the influence of marijuana). I suppose that decriminalisation of a currently illegal drug can be expected to reduce 1 and 2, though for pot 2 is already negligible. For 3, it depends on the psychological effects of the particular drug. Does marijuana really reduce inhibitions against violence the way alcohol does? Cocaine? I suppose nobody commits a a crime while on a heroin high. The ADAM study shows that the proportion of arrestees testing positive for cocaine ranged from 12-33% across cities. The numbers are a bit lower for heroin (though in the UK, the pattern would be reversed). The stereotype of heroin users is that they are not violent, but they can be very violent. The drug is soporofic, but as it is metabolised and the person begins to crave it again, they become agitated and easily infuriated. Thanks for the data, Keith. The arrestees testing positive for cocaine could be 2 (to obtain more of the drug, typically by theft or robbery) or 3 (under the influence, eg for public disorder or common assault), or both. Any ideas? The point is moot for current policy arguments, which are about marijuana not harder drugs. What’s the definition of violent crime here? Anything from simple assault on up? I’d be interested to see whether the mix has changed, what with decreasing tolerance for even relatively minor violent acts by some people. I’d also bet on the stock vs flow argument. Even a relatively small increase in the length of sentences for violent crimes could lead to a significant increase in the relative numbers imprisoned. Regarding the stock vs. flow question: The BJS publication “Prisoners in 2011” lists admission rates for California prisons in 2011 as one data point (see table 4 for a breakdown by offense type). Noteworthy is the big shift in Q4 2011 as a result of California being required to reduce its prison population. Personally I want to greatly increase the fraction of so-called nonviolent offenders in prison, using as our guide Gandhi’s insightful observation that poverty is the greatest violence. This, the banksters and other fraud artists and debt collectors who abuse the poor, the slumlords, the rent-to-own lenders, payday loan lenders, and most especially a whole lot of mortgage servicers … The ones before whom Eric Holder has fallen to his knees and serviced lavishly all these years. The best thing about jailing and imprisoning these mofos is that you need very little time to get full benefit — you send the average thug life guy up for five years and you’ve barely whetted a DA’s appetite. Send up a vice president for five years and subject him to the kinds of restitution orders that the poor routinely get, now that will get their attention. I’m all for sanctioning violent offenders; but I know that we’d have fewer of them if the laws weren’t all about ensuring that those whose illgotten gains were accomplished by fountain pen rather than MAC-10 never had to so much as visit a prison. The burden of crime from illegal marijuana production includes offences against the environment. H/t Erik Loomis at LGM. While it’s true that non-violent offenders are occupying a smaller SHARE of the state prison population, your focus on share doesn’t address the issue that the state prison population doubled between 1990 and 2010. So while the share of prison inmates admitted for drug and property offenses may have fallen from ~45% to ~38%, their numbers grew massively (drug inmates went from ~140k to ~280k). And this occurred while the U.S. resident population grew from ~248m to ~308m. Taken in that context, your statement in sentence 3 (“An even more widely embraced myth is that states have been increasingly incarcerating non-violent offenders.”) is not a myth. The growth in drug and property inmates far outpaced the growth in resident population. Jake — Well spotted! That sentence is indeed wrong as written, it should have referred to proportions and not numbers. Thank you for your sharp eyes. I have amended the post accordingly. This disregards any difference in the length of sentence imposed for a given crime. If the US locks violent offenders up longer than other countries, it will have a larger prison population of violent offenders regardless of whether it is actually a more “violent society.” By some measures (e.g., homicide), the US does appear to be more violent than other developed countries. However, overall levels of violent crime are difficult to compare due to varying reporting standards in different countries. Further, the US is notorious for the length of prison sentences it imposes, particularly in the context of mandatory minimums and three strikes laws. Basing an estimate on the relative incarceration rate, even just for violent crimes, will therefore almost certainly overstate the level of violence in US society as compared to other countries.